1 Day Sale (June 20, 2008) Digital Phone System! can I use magicjack to come in and out of the matrix? Kumar is back in the house! anyone have a broken ipod? Ooma Hub - Voip phone device? 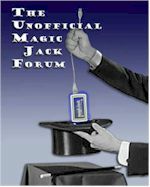 How are "Folders" Used and Setup in MagicJack? [ Poll ] Warning about Purchasing before checking for compatibility.